Today, I went to my first Thai restaurant.. and I wasn't disappointed! The Green Mango is a quite recent Thai restaurant near Palmeira Square in Hove. Besides the nice staff and the nice atmosphere, their food is known to be quite authentic (this is my Thai friends opinion :)). Let's talk about what I ate there! I did not take any risk and tried one of their most traditional dishes: the prawns green curry. The price was reasonable (£6,30 for the main dish) and the meal was actually very good! Although it was a bit spicy for my French taste. Of course, I couldn't finish my meal without something sweet (yeah French people and their deserts) so I ordered some Coconut milk sticky rice with mango. I really love the coconut sticky rice but I wasn't a big fan of the combination. I would have preferred to eat them separately but I guess that's just a matter of taste. 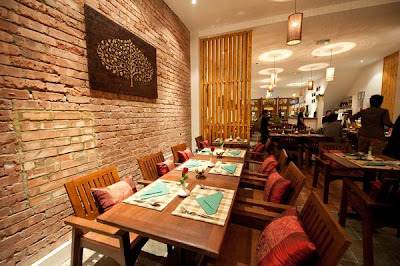 Anyways, if you're looking for a Thai restaurant around Brighton & Hove, I recommend you to try The Green Mango!